The data was added on ,	5 August 2016 read 641 times. The Syrian army troops repelled the terrorist groups’ attacks on their positions in Aleppo province, killing scores of militants. The terrorists were pushed back in the Syrian army’s counteroffensive backed by the popular forces in the Southern part of the city of Aleppo. Syrian army troops and popular forces repelled the terrorists’ massive offensive to regain control of the recently-freed al-Ramousa region in the Southern parts of Aleppo city, army sources said. “The terrorist groups attempted to seize control of al-Ramousa region after losing its control in an attempt to open a supply route towards the Eastern and Southeastern parts of Aleppo and close the main way of Syrian army and its allies in the Western districts of Aleppo but they were forced to withdraw and the Syrian forces retook full control of al-Ramousa region,” the sources said on Thursday. Also a military source said that after the terrorists were defeated at al-Modfaiya college near al-Ramousa village, other terrorists attempted to advance from the Northeastern regions through Sheikh Saeed district but failed. The source added that war has become so hard for the terrorists, predicting that the militants groups will withdraw from the region in the next few days. The army units also succeeded in repelling the terrorists’ massive raids on Manian village with the support of the residents, he said. Meantime, the Kurdish-led Syrian Democratic Forces (SDF) freed more ISIL-occupied regions at the Center of Manbij city in Northeastern Aleppo. After heavy clashes with the ISIL terrorists which still continue sporadically, the Kurdish forces could retake al-Haal Market and al-Sana’a district in Central Manbij on Thursday. ISIL’s fierce attempts to advance in the international Salamiyah-Khanasser-Aleppo road in Hama failed after the rapid and tough reaction of the army and its allies on Thursday. The army that was monitoring the ISIL moves near the road inflicted heavy loss and damage on the terrorists in a timely reaction and operations. Also the Syrian helicopters and fighter jets pounded the ISIL bases in Soha village in the Eastern parts of Hama, killing tens of militants and destroying their military equipment. 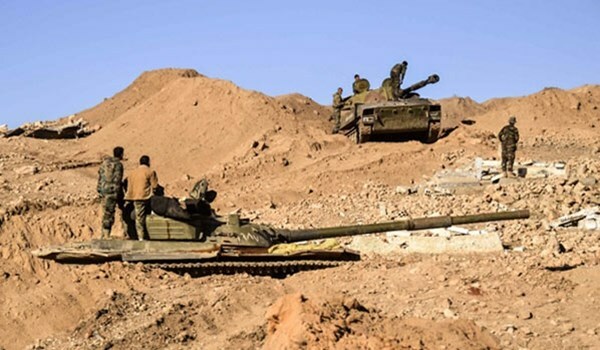 The Syrian army continued hitting the terrorists’ military positions and gathering centers in Sweida province, and inflicted heavy losses on them. The Syrian army carried out an operation against a gathering of the ISIL terrorists in the Eastern parts of Sweida province, inflicting heavy losses on them in arms and personnel. Two of the ISIL vehicles were also destroyed in the operation, one of them equipped with heavy machinegun. Dozens of terrorists were also killed in al-Muftira town in the Eastern countryside of the province. A unit of the army confronted the ISIL-linked terrorist groups as they were trying to move towards Tal Zalfa’a and Abu Harat in the Northeast of Sweida province. Military sources in Homs city announced that the army units, backed by their allies, engaged in heavy clashes with the ISIL militants near Arak oil field in the Northeastern parts of Tadmur (Palmyra), killing tens of terrorists, among them foreigners. The Syrian army units were also supported by the air force and artillery units which bombed ISIL’s centers in al-Sakhana town, several farms and supply lines used for transferring weapons and ammunitions, the sources said on Thursday. They also added that tens of ISIL terrorists, including Arab and foreign fighters, were killed in the clashes and attacks while several military vehicles were destroyed, some of them equipped with heavy machine-guns. Other reports also said that the Syrian fighter jets launched airstrikes on a number of regions near al-Sha’er oilfield in the Eastern parts of Homs. Meantime, the Syrian army units pushed back an attack on a military post in Homs, killing a number of terrorists and injuring others. The Syrian forces repelled the attack on a military post East of Talbiseh city in the Northern parts of Homs, killing tens of terrorists, injuring others and destroying their arms and ammunition. The army and its allies also destroyed the ISIL gatherings and hideouts in Sallam Gharbi and Unq al-Hawa regions in the Eastern countryside of Homs province. The Syrian warplanes destroyed three positions and several vehicles equipped with machineguns and carrying weapons and ammunition for the ISIL terrorists in Deir Ezzur, a military source said. The source explained that the airstrikes were conducted in al-Morey’ieh, al-Boghail’yeh, South of the Panorama and al-Jneineh in Deir Ezzur. Sources on the ground also said that ISIL “Emir” in Husseiniyeh village, Turki al-Hassa’a, was killed along with seven of his companions in a military operation by the Syrian army troops. The breakthrough helped the SDF forces to move towards al-Sour school and al-Tal district in the Eastern parts of al-Haal Market and al-Basetah village which were later liberated from the militants. The Syrian army’s massive attacks on the members of a terrorist group in Dara’a al-Balad killed tens of them near the city’s cemetery. A number of terrorists were killed and others were injured in precise operations carried out by units of the Syrian army in Dara’a province. A military source announced that an army unit carried out intensive strikes against a terrorist group positioned near al-Bahhar cemetery in Dara’a al-Balad area. Another army unit destroyed a den of terrorists in the area surrounding al-Thaila hill in the Western part of Dara’a city. Meanwhile, most members of a terrorist group linked to Fatah al-Sham (the newly formed al-Qaeda-affiliated terrorist group previously known as al-Nusra Front) were killed Southeast of Khazan al-Karak in Dara’a al-Balad, according to the source. Another army unit destroyed terrorists’ fortified positions East of the Electricity Institution, killing a number of terrorists and inuring others in the vicinity of Bosra Square in Dara’a al-Mahata area.